Explore some additional DPA features that you may or may not already use. Historical charts can help you identify what’s driving poor performance. Annotations are a great way to collaborate with your team or other silos. Naming queries makes DPA a bit more human friendly. Exclude queries that skew the scale on your charts – especially if that’s not quite the thing you want to focus on for whatever reason. Welcome everyone, and thanks for giving us a little bit of your time today. I really don't think that this is going to even span the whole half hour that we've allotted for this. So, hopefully we'll be able to give you a few minutes back in your day. And, by way of introduction, this is DPA - Beyond the Basics: Episode 5, so we're catching up to Star Wars here pretty quick. Today we're going to do a little deeper dive into some features in DPA that you guys may or may not know about. One of them is going to be how to name SQL hash. So, we have this algorithm where we actually assign a unique identifier to SQL statements. But, sometimes they're not real user-friendly. So, we'll show you how to do that. Annotations is a way to note events that take place, or notable kind of things within your environment. Like, let's say you change a database parameter, or option, or settings, or something like that, and you want to share that with the rest of the team. It's a great way to do that within the product. We're going to look at historical charts, and show the value that it brings to a DBA. And then we're also going to look at how to exclude SQL from our trend charts. So, that is what's on the docket for today. And, I'm joined today by Thomas LaRock, who, by title, is a Data Janitor. We just came up with that just prior to, so welcome, Tom. Thank you. I think we're all a Data Janitor from time to time, don't you? I feel like that many times. Absolutely. Well, you know, there's data custodians, and then there's Data Janitor, right? Clean-up is a lot of what we do. That is absolutely correct. [Laughs] All right, so I'm going to go ahead and share my screen, here. Let me hop over there. Okay, so hopefully you guys can see my screen. Okay. Cool. Might've taken it just a second. Um, yeah, so let's punch into the first feature, and, by the way, these Beyond the Basics, the whole intent here is to make sure that DPA users out there are getting the full value out of it, and at least are aware of certain things that they may not be aware of within DPA, so it's just to help you, you know, kind of use our product to the fullest extent. So, let's go into naming a hash value. As you can see here on the right-hand side that when I'm drilled into an instance in the trend view, you see a list of numbers off to the right. Now, unless you are very mathematically oriented, or just a numbers person or whatever, this may not be the friendliest way to view these. So, I might even want to come in and click on one, which gives me a couple options, here. The first option is to name it. 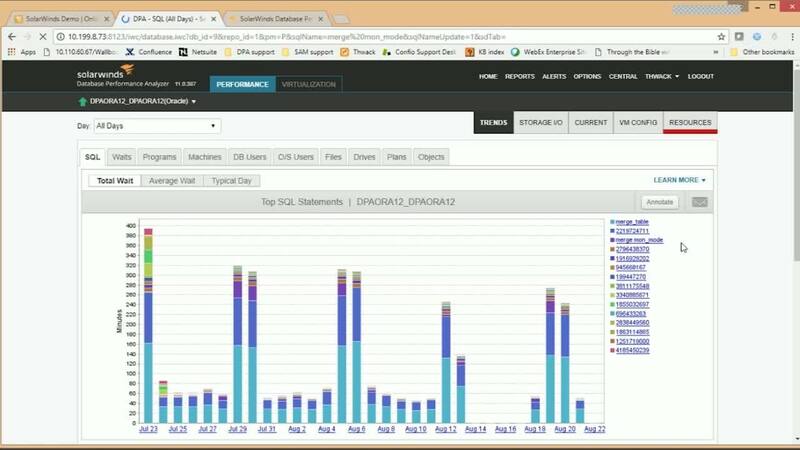 I can also run an ‘analyze.’ So, DPA, by default, runs an analysis of the top five SQL statements running in your environment for any given day. And, this allows you to go back and do a little deeper dive if it's not one of those top five. Right, so you can ad hoc kind of say, "Hey, go ahead and analyze this guy." But, on this one, I'm going to go ahead and name it. And I'm going to name it ‘merge mon_mode.’ Just because I see that that's one of the sys objects that we're gathering, there, or hitting. So when I click OK it will go ahead and rename that to ‘merge mon_mode.’ Makes it a little more human friendly. And by the way, that naming convention will translate through. That will persist. So when I drill on a specific day, and I get my top SQL for that day, it follows along with me. Okay, so that's one nice little handy feature. Might not want to name them all, might not have to. But if there are certain ones that you want to make sure that you're paying attention to, or want to be able to recognize very quickly, that's a great way to tag it. All right, also we've got the ability to annotate things within the product, so I'm going to go ahead and click on that. By the way, the annotate is available on just about every trend view page or Time slice. So even if I go into, I believe it is. Make sure I'm not a liar, here. Um, if I go into an hour, go to Time slice. Yeah, good, okay. So there is a way to annotate it. So, I go ahead and click on that, and this allows me to really notate anything that I want to. And this is, especially if you guys are working in a larger team setting, or maybe have multiple people accessing DPA, it's a great way to share that information. So let me just match them up, here. Let's see, eight gig to 16 gig. Something like that. And then I can put the time in, and I'm just going to do it for today. Sure, why not? Did it at nine o'clock, and we'll just leave those the same. I can also put a detail in there, and we'll just put something in there. There we go. So when I do that, you guys will see that that annotation is now on my main trend screen, so note that I made it for today at 9 a.m., but I'm actually looking right now at Saturday. So if I jump forward to today, or maybe even go out to the overall trend view. Yeah, that's a better way to do it. But you can see here that it pushed, it put a little flag. That means that an annotation did occur, there's an event of note. And if I hover over it, I can see some information on that. And then if I click on it, I can get all the details, and I can get the, you know, whoever created it. Things like that. So let's go ahead and click on it. And there we go, I get the whole thing. So I can delete it, I can edit it if I want to, if I click in here in annotations. But again, a great way to share information across, especially in larger team settings. Okay, so and that, that's the first couple features here. I think I want to turn it over to Tom now, and Tom, do you have the ability to share? Do I have to make you a presenter? Okay. So, Tom, I think you're a presenter now. Perfect. And I'm going to turn it over to Tom, who's going to talk to you about historical charts. Sorry, I was saying lots of really good things, but I was muted. Can you hear me now? Cool, and you can see my screen, yeah? Awesome. So, Rob's walked us through a little bit of the naming and the annotations. I love the annotations feature. It's one of the things that we added back in the day when we were starting to incorporate virtualization metrics, and I advocated for that feature for annotations simply because I'd want to know if a VM had been powered on or off at some point, right? So, that was how they first got into the product, and I think over time we've just seen them get used a little bit more for a variety of reasons, as Rob spoke to. But what I'm going to talk about is one of the reasons that I fell in love with DPA back in the day. So, I'm a former customer, and about seven years ago I came to work for the company. And, this is, I'm going to show you one of the main reasons why I thought DPA was just the greatest thing since sliced bacon. So, what you're looking at here is the trend screen. And the trend screen, what I have up here, is basically showing you how we do more than one platform. So if you are the type of shop that has more than one database that you're going to be responsible for, DPA is a great way to have everything in one tool. So, one dashboard, one single way of viewing things, right? So, what we're going to do here, though, is we're going to drill into SQL server. I'm going to grab DPA SQL 2016. And what you're going to get is a trend chart, right? By default, you're going to have a 30-day rolling window, we've got about two weeks’ worth of data that we've collected for today, here. And what you see is, day by day, all these bars represent, you know, individual SQL statements. So, if I hover over one, I'll get information about, I see it's a simple update statement. Number of executions, percent of wait time, all this great information. But if I click, I can drill into a specific day. And as I drill into the day, I'll get a midnight to midnight view, so you can see, what happens here is that some people show up to work about seven o'clock, and they stay 'until about six. Apparently nothing happens overnight, or at least nothing on this server. And we'll just pretend that I've been called because somebody complained and said, "Hey, what happened yesterday at 3 p.m.? Something was happening, can you figure out what the problem was?" And what I'll do, is I'll look at 3 p.m., and I'll notice that, ah, maybe this guy, maybe this query was the issue, I don't know. But, why don't we just click? And now I, this is my breadcrumb trail so I don't get lost, I'm looking at this server on this day from 3 to 4, and now I get dimensions of data for me to filter through in any possible way. But what I'm looking at here now, this particular query, right? And I can see that this query was the one that had the largest amount of wait across all executions, and I, you know, there's that Pareto Principle that 80% of your problems are caused by 20% of your queries. Well, you can see that kind of bears out here, because if I was to go down, you'd see most of the queries here didn't have much weight at all. But you see this one up here, and I get an idea over here of what those waits are, so this light blue here is a schema lock, right? And if you don't know what that is, you click, you get a description, you get to look at it and say, "Oh, I understand what's happening now." Maybe you do, maybe you don't. And if you don't, we provide some links, you can go out and get more information about all this, right? But, now if I click one more time, I can get a little bit more information about this particular statement. I see it was executed, again, between 3 and 4 p.m., executed about 3,200 times, processed 58, or 5.8 million rows, 3.4 million logical reads. It's just doing a simple select, ORDER BY postal_code, ah, it's an idea. But right here, right now, I still don't have enough information to solve the problem. If you remember, we said, the call said, "There was a problem between 3 and 4 p.m. yesterday, go figure out what it was." Okay, well I've come here, I've found this query. I can see that it was the largest consumer wait time across all executions, but I really don't know if it's a problem. All right, I need to know two things as a DBA. One, is this a problem and two, what can I do about it? So, what DPA has, and again, this is one of the biggest uses of the product, is the historical charts. So now I can come over here, and I can look very quickly and easily, and I can see what is normal for executions across a day for this particular statement for a period of time, right? I can see that executions on a daily basis are roughly the same. Now, today, we're looking at today. Today's not done yet, right. So, if I'm looking over time from the 22nd onward, I don't think that the executions are any higher. Rows processed, physical reads, everything seems to be about the same. Again, the 23rd is a partial day. What I have here is, I have here a baseline. Says this query runs at about 119 milliseconds on average. So I'm guessing that this query likely isn't the issue for this person. All right, I'm 95% certain that's the case. When this query runs, it runs very quickly, right? Right here and then I can come down to this screen, and I can say, "All right, I've looked at it. Here's the query, here's the baseline information, and here's what it was yesterday." And on this screen alone, I can share this with the wider team and just sort of say, "All right, this is the query that we've been focusing on, and as you can see, this is the performance that it had yesterday, on average, compared to a larger piece of time. You can see that it's not an anomaly, right? It's pretty much the same as it's always been." So, that alone was a huge value for me. And, remember, this was across more than one platform, so I still had some instances of The Artist Formerly Known as Sybase. And I had to, you know, be the DBA for both these systems, and I needed to present information in a clear and concise way. Now, that took four or five clicks. If needed, I could come back to that main trend screen. Well, we have the historical right here, so here's the query I'm looking at. One, two, and I'm right back at that same screen. Right? So we've streamlined that quite a bit. So, Rob, as you were saying, if you were back here and you had named this guy, you know, whatever, if we had renamed it to something, it'd be a lot easier for me to come at this main screen, pick out the one that's been named, click on it, and get right back to those historical screens. All right, I'm going to send it back to you. All right, sounds good. All right, so I'm going to cover one more thing, and this one's going to go pretty quick. All right, I don't have your screen yet, hold on. Cool, can you guys see my browser now? Okay, perfect. So, one more thing that I'm going to show you guys is really how to exclude a SQL statement from our trend view and there may be reasons we’ve got to use this kind of carefully, because it can actually hide some things from the trend view if you forget that you had excluded it from visibility. But, a lot of times, and this came about specifically as an end-user request. They said they had one query that was just totally skewing the scale off on the left hand side. And it really didn't allow them to see anything beyond this one huge major, you know, SQL statement that was taking up all the waits. So, in order to go ahead and hide that, you can just click on the statement, or the hash or whatever. And here we have this little toggle here that you can click to off. And when I do that, it is going to erase it, and redraw my trend chart. So there we go. See how that merge statement just kind of disappeared? Now, you do that, and this will persist again. So keep that in mind that this will follow throughout the entire product anytime you're looking at trend views and stuff like that. You will not see that hash value or that SQL statement that we renamed. So, if you want to get it back... So, once I did that it placed this little notation down at the bottom that we have had some that were excluded, and if I want to bring it back I can click on the Excluded SQL Statements, and go ahead and bring that back to my screen. Okay. So, pretty simple functionality there, but, again, probably important, if you guys are in a situation where there's maybe a SQL statement that is totally skewing the scales, and you're trying to get visibility into all the other statements that are running, or if there's just something that you want to exclude for whatever reason. It's a statement that we just can't do anything about, I'm aware of it, I know about it, but I just don't want to display it in a chart. Okay. So, at that, that pretty much wraps it up for today. Just a couple of things to point out, here. We've got a little polling question. So if anybody wants to reach out to us, and get a little more personalized visitation or whatever with us, that's perfectly fine. We would love to spend some time with you, you know, on a one-on-one kind of basis. Also, the, I'm going to go ahead and share the link here for the webpage where these guys live. So, you can see here that we've got, let me go ahead and close that. I don't know if it's in the way. We've had, this is our fifth episode, so we've done one, two, three, four, and then today. So if you guys, I posted this in the chat comments as well, so if anybody wants to go back and retroactively kind of look at these, no problem. Or if you want to join us for the next one, which is scheduled for September 21, it's going to be Getting Creative with Reports and Metrics. So there are some really cool things that end-users can do, and that I've done personally, to really extend the functionality of DPA. You know, a lot of times, as DBAs, we come into this tool and we've already got a bunch of scripts, and Tom, I know you do, have a ton of them and stuff. But, it's like, you don't want to necessarily leave those scripts behind, right? So we want to give you a way that you can leverage them within the product, and then everybody gets to take advantage of them. Okay, at that, I hope everybody filled out the poll question and like I said, I didn't think that this would take the entire half hour, so I'm going to go ahead and give you guys 10 minutes back of your day. So, be sure to use those 10 minutes wisely. All right, thanks everybody for joining us, and hopefully we'll see you here for episode six. With Reports and Metrics. All right, thanks, Tom, thanks everyone.